A 504-acre parcel once considered as part of an international freight airport will instead become the Portage Park District’s largest park, thanks to a partnership between government agencies, private donors and a nonprofit land trust. 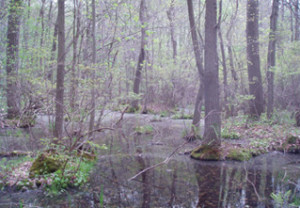 Portage Park District and Western Reserve Land Conservancy, a nonprofit organization working to preserve natural areas and farms throughout northern Ohio, have announced the acquisition of the Upper Cuyahoga Bog Preserve, which is south of the Ohio Turnpike and east of state Route 44 in Shalersville Township. 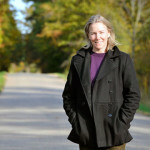 Christine Craycroft, Park District Executive Director, said that because of the restrictions imposed by the grants, which were for water quality protection and wildlife habitat, plans for the property will be for passive uses such as hiking, bird watching and educational programs. The property is home to several rare and endangered species, including the yellow-bellied sapsucker bird. The wetlands, woods and fields there also protect 8,000 linear feet of a tributary to the Upper Cuyahoga River. The Land Conservancy will hold a conservation easement on the property. A conservation easement is an agreement under which a parcel’s natural and scenic resources are permanently protected. 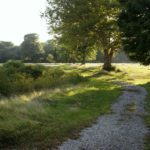 The opportunity to acquire the property was made possible with the professional assistance of the Land Conservancy, which helped apply for funding through the state’s Water Pollution Control Loan Fund. In this case, the Northeast Ohio Regional Sewer District sponsored acquisition of the land as part of the loan agreement it has with the Ohio Environmental Protection Agency for improvement of its sewer system. The program makes efficient use of EPA dollars for water quality by linking watershed protection funding with sewer system funding. Chris Szell, associate director of regional conservation for the Land Conservancy, said regional cooperation was the key to obtaining funding for the park. Szell commended NEORSD for acknowledging that stormwater runoff problems and watershed protection issues extend beyond community boundaries. 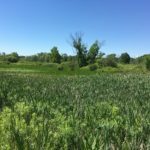 The Land Conservancy also secured a Clean Ohio grant for the project as well as funding from foundations and partner organizations, however no funds from Portage County were used. The park project also had the support of Shalersville Township trustees, who have viewed conservation of the land as a cost-effective alternative to the hundreds of acres of housing that had recently been proposed for the site. Before that, in 1991, there was a proposal to build an international freight airport on the property. Those plans never materialized. The Land Conservancy, which works to protect the scenic beauty, rural character and natural resources of northern Ohio, is the state’s largest land trust. It has preserved more than 250 properties and more than 15,400 acres. The Portage Park District, whose mission is to conserve Portage County’s natural and cultural heritage, now has 12 parks and preserves totaling more than 1,200 acres and 15 miles of hike and bike trails. However, because multiple efforts to pass a park levy have been unsuccessful, most of those properties remain closed to the public. The Park Board recently formed the Portage Park District Foundation and is seeking donations to provide support for operations and park improvements. For more information on how you can help, contact the Park District at (330) 297-7728 or visit www.portageparkdistrict.org.